Sanie had seen unthinkable things. The 4-month-old puppy cowered inside a metal cage as she watched a butcher grab dog after dog and brutally kill them for their meat. The dogs howled in pain, and Sanie’s skin shook as she watched it all happen. Any moment now, it would be her turn. But then, something happened to rewrite her future. 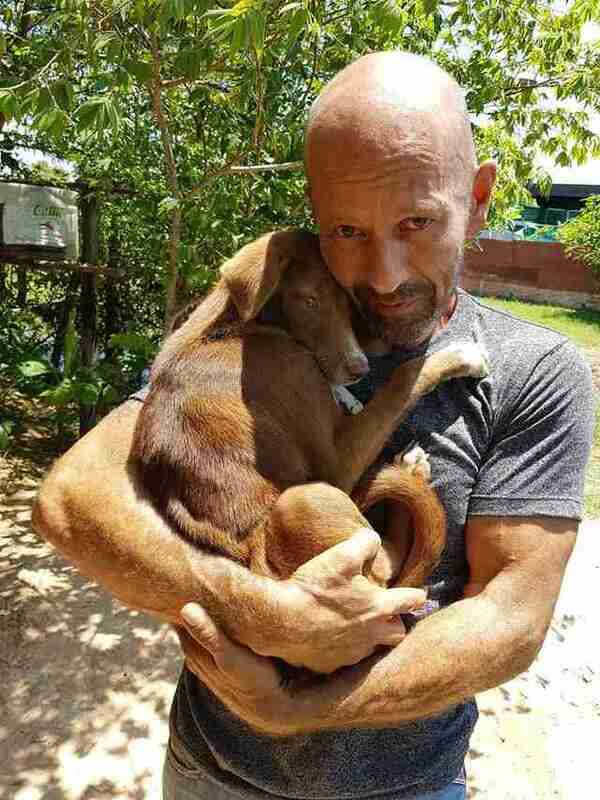 Michael Chour, founder of The Sound of Animals, a group that saves dogs from the meat trade in Southeast Asia, visited the slaughterhouse in Phnom Penh, Cambodia, where Sanie and two other dogs were being kept. 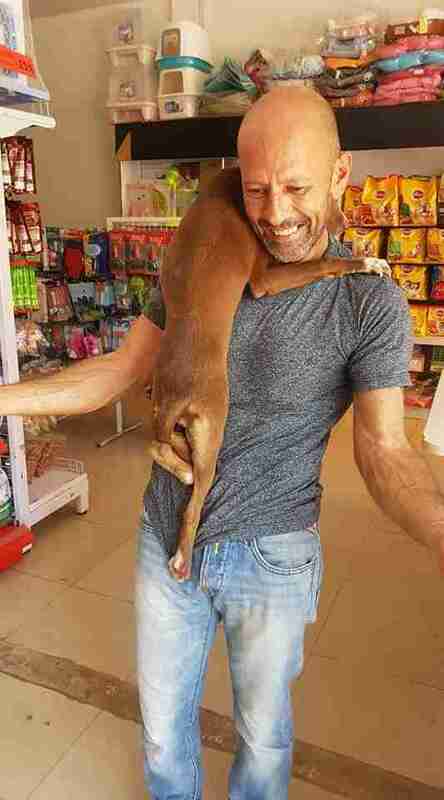 Chour tried to convince the owner to relinquish all three dogs to him, telling him it would bring him good karma. But the owner refused to give up two of the dogs, explaining that they’d already been sold. He did, however, tell Chour that he could take Sanie. Chour knew that Sanie was petrified, so he crawled into the cage with her to try and gain her trust. When Chour gently touched Sanie’s head, she froze, probably wondering if he was going to kill her. But Chour was patient. He spoke to her in a soft, soothing voice, telling her that she was safe — and Sanie seemed to understand. When Chour put his hand beneath her belly, she allowed him to take her into his arms. From that point on, Sanie wanted to be as close to Chour as possible. Chour believes that Sanie used to have a home in Cambodia, but someone grabbed her from her family’s property and sold her to the slaughterhouse. While Chour doesn’t think it’s possible to find Sanie’s original owner, he’s promised Sanie he’ll keep her safe and find her a new family. 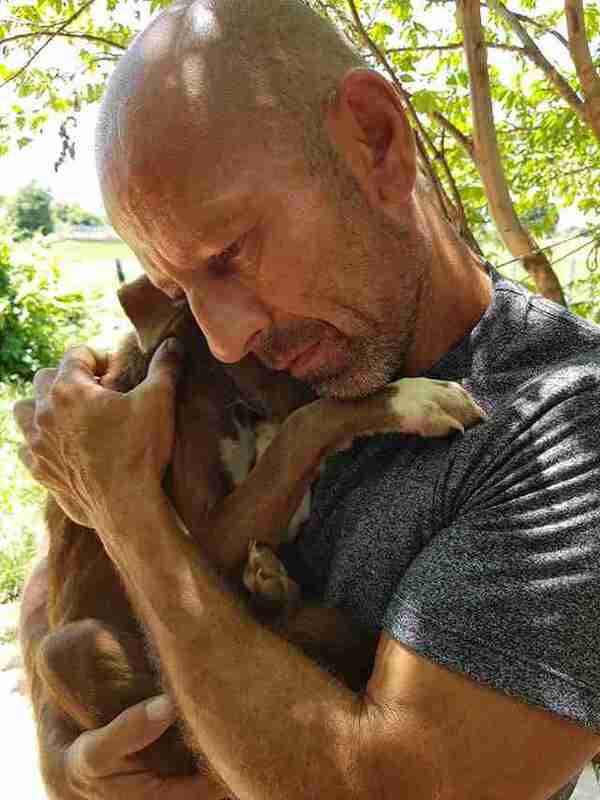 After getting checked by the vet, Chour took Sanie back to his group’s shelter, Blue Dream, where Sanie will meet other dogs rescued from the meat trade. 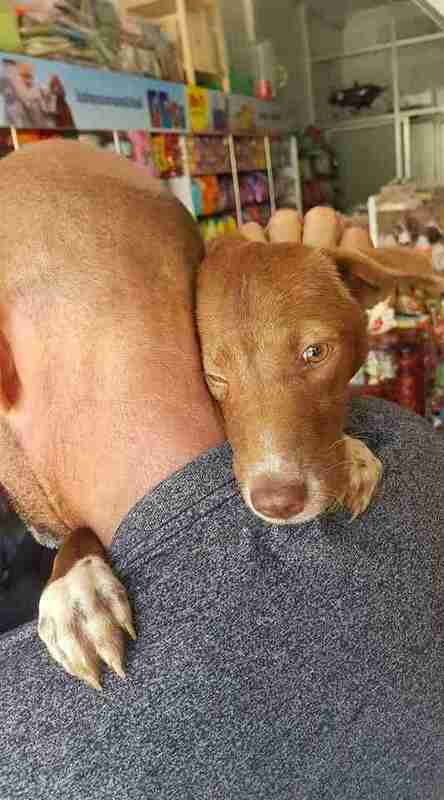 Sanie is safe, but Chour will continue saving as many dogs as he can from the meat trade. 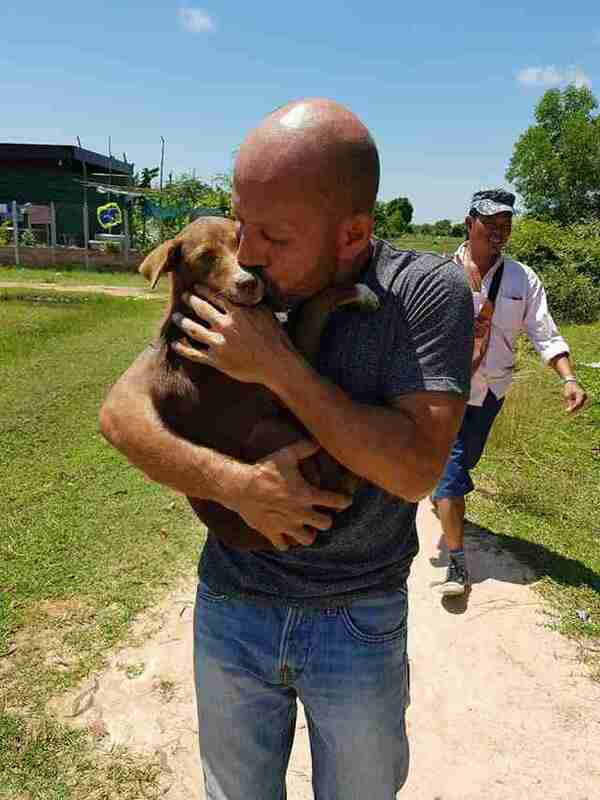 While Chour lives in Thailand, he often travels across the border to Cambodia to help dogs. 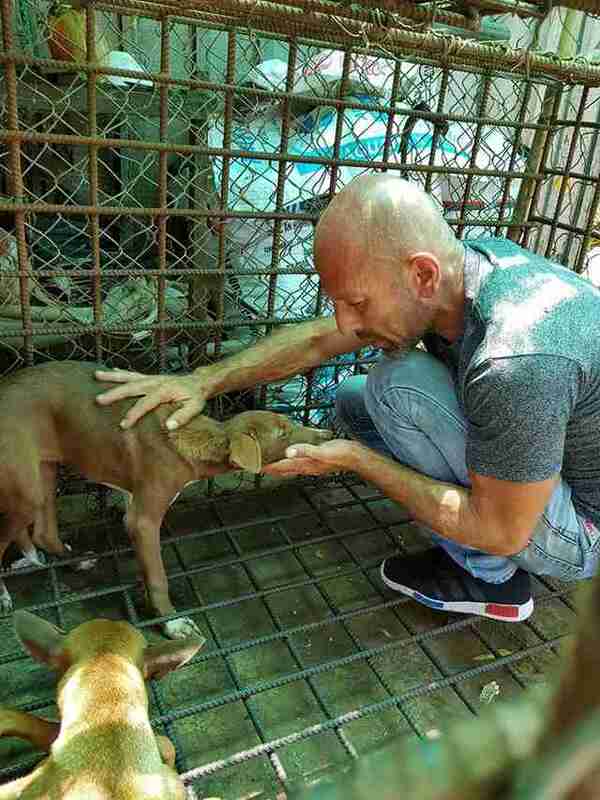 To help Chour rescue more dogs from the meat trade in Southeast Asia, you can make a donation to The Sound of Animals. If you’re interested in adopting Sanie, you can contact the rescue through its Facebook group, Dogs for adoption from Sound Of Animals.